what happens if everybody rushes to adopt them? Could the electricity grid and materials supplies possibly cope? 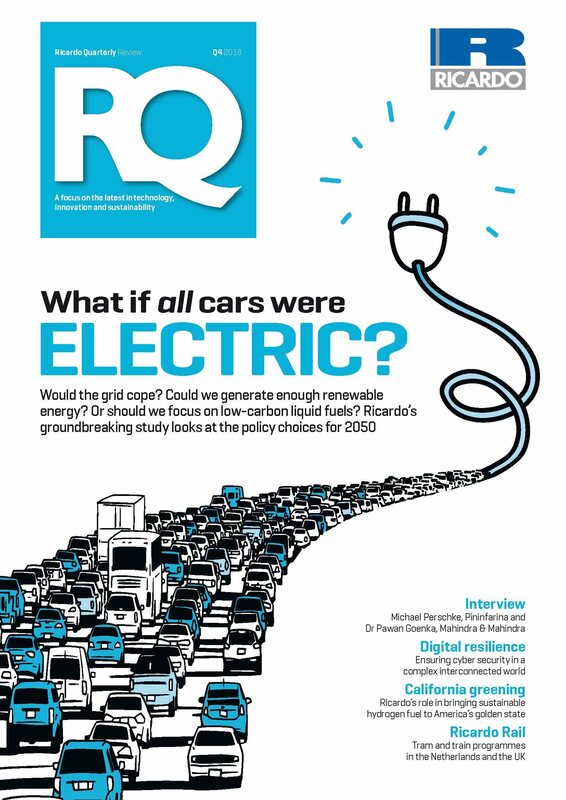 Or would a migration to more lowcarbon liquid fuels be a better answer? These are among the competing scenarios for 2050 tested by Ricardo in a ground-breaking new study that has set commentators talking. With September’s IPCC report on climate change as a timely wake-up call, Europe’s policymakers face weighty decisions on how the continent’s road transport should best drive into the low-carbon future enshrined in EU legislation. Will that future be electric? What about hydrogen power? and heavier vehicles. What is more, unless charging demand is carefully managed, a mass rollout of electric vehicles would place huge stresses on the electricity supply infrastructure, requiring significant investment. Better and speedier, argue some, would be to accelerate the shift to low-carbon liquid fuels. These offer the hugely tempting advantage of retaining large parts of the existing fuel supply infrastructure, and they can potentially go directly into the gasoline and diesel vehicles we are already using today. enough low-carbon fuels to power our conventional cars into a clean future? in European automotive GHG emissions by 2050 compared with business-as-usual (BAU) projections, the study developed two deliberately very contrasting scenarios. (46 percent) share of plug-in vehicles. Both scenarios were scoped to deliver tank-to-wheel (TTW) GHG savings of 90 percent compared with 1990 figures, as well as a reduction in total parc lifecycle GHG emissions to 13 percent of their 2015 value. future costs of EV batteries, the availability of low carbon fuels, and also significant risks associated with the supply of lithium. planners with insights into the potential implications of a move towards either extreme. A halfway-house Alternative Scenario has been modelled, too.